Venezuelan President Hugo Chavez has died, hours after his Vice President accused "enemies" of being responsible for his cancer. Venezuelan President Hugo Chavez has died, Vice President Nicolas Maduro said Tuesday, according to CNN. In a national broadcast, Maduro said Chavez died Tuesday at 4:25 p.m. local time. He was 58 years old. 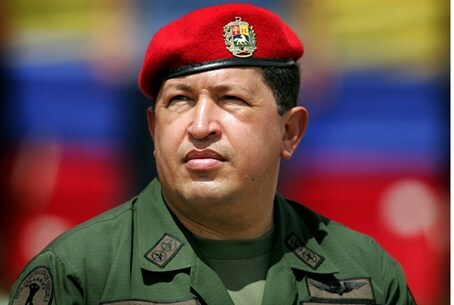 Chavez succumbed to cancer after months of treatments in Cuba and after being in power for 14 years. The Venezuelan president had used oil, money and vitriol to spread his "Bolivarian revolution" to neighboring states, playing a role in bolstering leftward turns in Ecuador and Bolivia and backing revolutionaries in Colombia. He hectored the United States often, belittling its leaders and cozying up to its adversaries. News of Chavez’s death came just hours after Maduro accused the country’s "historic enemies" of being responsible for the President's cancer. Maduro said he would ensure that a scientific commission be formed and that it would reveal that, "Chavez was attacked with this disease... The historic enemies of this nation looked for how to harm the health of our commander," according to AFP. Chavez's hand-picked political successor spoke hours after the government announced that the leftist leader had suffered a new and severe infection and that his breathing had worsened, putting him in a "very delicate" state. Maduro also announced a United States embassy military official was being expelled from the country for seeking out active Venezuelan military officials to get information about the armed forces and propose "destabilization projects." He named an Air Force attache, David Del Monaco, and gave him "24 hours to pack your bags and leave Venezuela." The president began chemotherapy after his fourth cancer surgery in Cuba in December, and he is continuing the "intense" treatment at a military hospital in Caracas, Maduro said. Anti-Semitism in the country has sky-rocketed in recent years, resulting in a dramatic reduction in Jewish population. Before Chavez came to power, the Jewish community amounted to approximately 30,000, while today its numbers reach a mere 9,000. Tel Aviv University's Kantor Center for the Study of Anti-Semitism noted in September that Venezuela has witnessed a rise in “anti-Semitic manifestations, including vandalism, media attacks, caricatures, and physical attacks on Venezuelan Jewish institutions."